John Peterson knows a thing or two about the struggles of the family farm. After losing his northern Illinois farm, and a sizeble majority of his land, in the 1980s due to a combination of skyrocketing interest rates, mounting bank loans and underperforming crops, Peterson was poised years later to fail a second time as he tried to farm his remaining acreage. But in the early '90s, he found salvation in an unlikely place: a small but passionate group of environmentally minded Chicago shoppers who happened to be on the hunt for a rural farmer rich in organic produce. Seeing the name of Peterson's farm on the underside of an onion in the grocery store, the group made him an unusual business proposal: For a set rate, these Chicagoans would fund Peterson's operation, and in exchange, he would keep them stocked with fresh food through the harvest season. Within a few years, Peterson was not only back on his feet, but had attracted hundreds of interested shareholders, all intent on saving his farm. He also, along the way, became the star of a documentary film, The Real Dirt on Farmer John, which opens this weekend in New York City and in several more cities over the coming weeks. An account of Peterson's struggles as a family farmer and his recent success as part of the grass-roots "community farming" movement, the film, directed by Taggart Siegel, was released on the festival circuit in 2005 and has been traversing the world ever since. As it has toured, Peterson has traveled with it, championing the issues of localized farming and sustainable agriculture much as Al Gore  who himself has enthusiastically praised Peterson's efforts  has led the way on the issue of climate change. 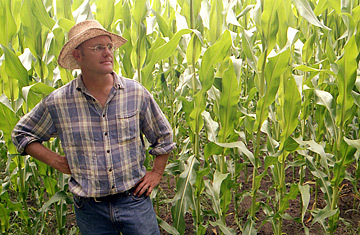 The film highlights the success of community-supported agriculture (CSA), the concept those Chicagoans originally brought to Peterson. "My wife and I had just returned from Burlington, Vermont," recalls Bob Scheffler, who helped organize the Chicago CSA group, "and somehow our friends out there had stumbled on a small, three-acre farm just outside of town run by a commuter farmer. He lived in an apartment in town, left his tractor chained to a tree and he would bring food into town. So he was farming this plot for a bunch of people in town. Everyone seemed so happy with the arrangement, and we thought: 'Wow, what a cool idea.'"